2004 ALK Technologies Ltd, leading developer of navigation systems, today announced the worldwide availability of CoPilot Live GPS Navigation for mobile phones. The new system transforms a compatible Microsoft Windows Mobile-based Smartphone into a powerful, ultra-portable in-car Sat Nav system, integrating the same award-winning CoPilot technology as is currently available for Laptops and Windows Mobile-based Pocket PC PDAs. CoPilot Live takes full advantage of a Smartphone's colour screen, powerful processor, and loud speaker to provide drivers with accurate and dependable door-to-door guidance turn-by-turn both on-screen and spoken. 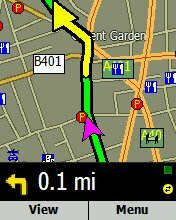 Intelligent route recalculation instantly works out the best new route if you miss a turn. Bad news for paper maps, great news for drivers, with CoPilot Live Smartphone driving anywhere is like driving around your home town. It's impossible to get lost. 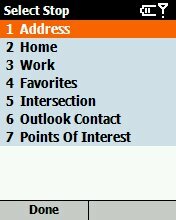 Inputting a destination is easy. Simply reach for your phone, enter in a street number, post code, town, Microsoft Outlook contact or one of thousands of points of interest and start driving. There's no need to input your starting point as a CoPilot-enabled Smartphone takes advantage of the Global Positioning System (GPS) satellites to pinpoint your exact location and continuously calculates the route to your destination. Designed with driver safety and adherence to legal requirements as the priority, CoPilot Live Smartphone avoids the need to touch the phone while driving, providing clear voice directions and at-a-glance turn instructions on-screen at every instant. Drivers can choose from a variety of map views, including 'Where Am I', 3D view and Driver Safety. 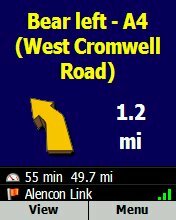 Estimated time of arrival, distance to the next turn and distance to destination are always displayed. 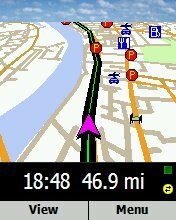 Numerous customisable options include low-glare night mode, fastest/shortest route and avoid tolls. In Europe, CoPilot Live Smartphone incorporates the same detailed street maps from NAVTEQ as used by the majority of in-car sat nav systems, including the UK's M6 Toll road, Channel Islands and extensive coverage of Ireland. European travellers can take advantage of CoPilot Live's borderless routing right across the continent, taking into account the correct side of the road to be driving on and the right direction at roundabouts! Wherever the destination or whatever the vehicle, drivers can benefit from GPS navigation on their mobile phone, without the inflexibility and high cost associated with built-in systems. Detailed street Maps and software are supplied preloaded on a 128 MB storage card making set-up incredibly easy. The live element of CoPilot takes full advantage of the seamless wireless connectivity provided by Windows Mobile-based Smartphones. Real-time web-based tracking, two way messaging and new destination sending are included as standard. Businesses can remain digitally connected to their mobile employees while consumers can stay connected with family and friends when on the road. Real-time traffic alerts and avoidance empower drivers with the information they need to get to their destinations with minimal delays. CoPilot Live Smartphone is compatible with all Bluetooth-enabled Microsoft Windows Mobile-based Smartphones, including the new Orange SPV C500 and forthcoming Motorola MPX 220. Its available to purchase through authorised CoPilot Live dealers from Â£150 for software-only versions, and Â£299 for complete kits. For further information visit www.alk.eu.com.